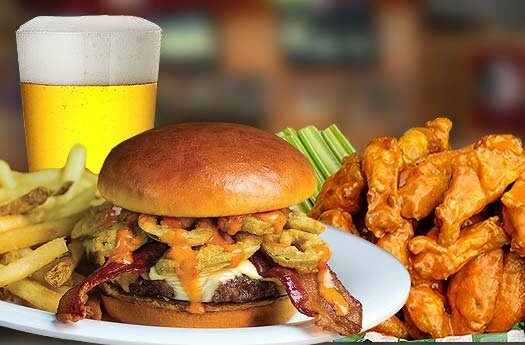 1410 North Rock Springs Road, Apopka, Fl 32712 Order Beef O' Bradys - Apopka quickly and easily online for delivery. iCrave Delivery offers delivery from the best restaurants in the Apopka area straight to your office, hotel, or home! This signature burger is seasoned with a unique blend of herbs and spices, topped with melted provolone cheese and served with mayonnaise, lettuce tomato, pickle and onion. Includes your choice of one side item. 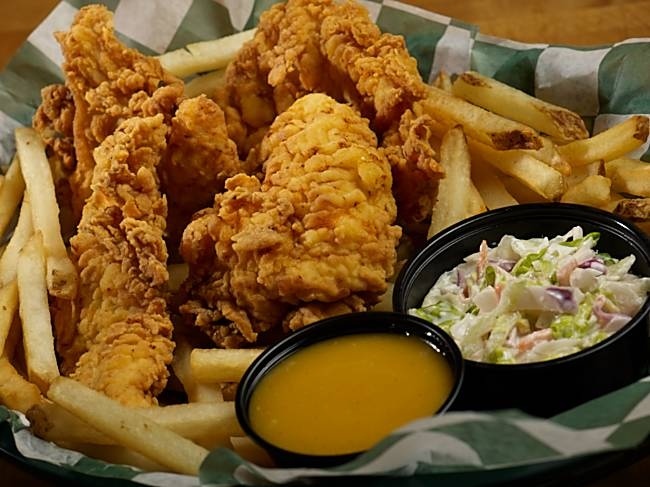 4 crispy chicken tenders, hand-breaded and fried to perfection, served with BBQ Sauce or Honey Mustard. Includes your choice of 2 side items. Fresh Angus topped with bacon fried jalapenos, pepper jack cheese and sweet jalapeno mayo. Loaded with flavor! Thinly shaved steak grilled with green peppers and onions, topped with white American cheese on a famous Amarosa hoagie roll. Planks of whole milk mozzarella coated with with italian style bread crumbs, lightly fried and served with marinara sauce. Kick things off with one of Beef's Classic Starters. There's plenty of time for the main course, and your team with thank you. Plenty to share if you dare! Crispy chicken fingers, mozzarella planks, onion rings and a cheesy quesadilla. NO substitutions, please! Add queso or chili to fries for $0.99. 6 of our award winning jumbo wings tossed in one of our dry rubs or famous sauces, paired with your choice of pickle chips, fried mozzarella or onion rings. Our fresh, hearty soups nourish and satisfy. Enjoy by the cup or bow. Add Cup of Soup or Regular garden Salad to any Entree $2.49. We fry in Trans Fat-Free shortening. Served with Celery and Bleu cheese. Extra bleu cheese, ranch or celery $0.50 each. 1/2 lb steak burgers made with 100% USDA aged steak and served on a warm, toasted bun. Cooked to your perfection. Add your choice of cheese (American, White American, Swiss, Pepper Jack, or Provolone), Smoked Bacon, Salsa, Grilled Onions, Mushrooms or Peppers for $0.50. Smothered with tangy BBQ sauce, melted American Cheese, smoked bacon and two crispy onion rings, served with lettuce and tomato. Includes your choice of one side item. Beef's 1/2 pound steak burger is smothered with sauteed mushrooms and melted Swiss cheese, served with lettuce & tomato. Includes your choice of one side item. Served with your choice of two: pineapple coleslaw, fries, broccoli, or mashed potatoes and Guinness Gravy. 2 marinated chicken breasts grilled or blackened served with your choice of honey mustard or BBQ sauce. Includes your choice of 2 side items. Our large fillet of mild white fish served just how you like it - grilled, blackened, or fried with fresh lemon and tarter sauce. Includes your choice of 2 side items. 20 Juicy shrimp grilled or blackened and served with cocktail sauce and fresh lemon. Includes your choice of 2 side items. 6 oz sirloin seasoned with kosher salt and pepper then grilled to your liking. 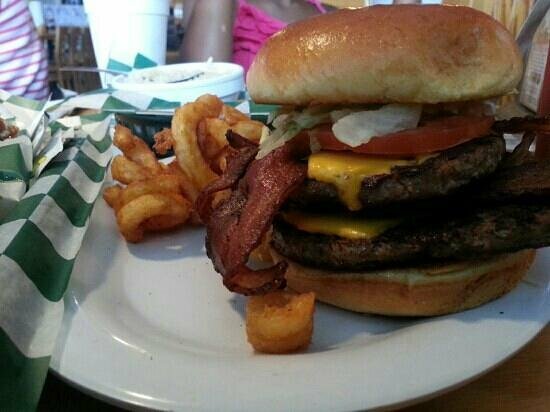 Served with a side salad and choice of one side. Our grilled 8 oz. salmon is seasoned with kosher salt and pepper and has a mild and moist flavor. Served with a side salad and choice of one side. You'll fall for this hook, line and sinker. Delicious beer-battered cod fillets, fried to a golden brown, served with tarter sauce and fresh lemon. Served with fries and creamy coleslaw. 10 tail-on shrimp fried to a delicious crunch, served with fries creamy coleslaw, cocktail sauce and fresh lemon. 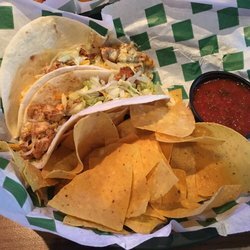 Beef's signature soft tacos with southwestern grilled chicken topped with lettuce, cheddar jack cheese and creamy Poblano sauce. Served with freshly made tortilla chips and salsa. Angus skirt steak topped with lettuce, cheddar jack cheese and our famous creamy pablano sauce. All kids meals include your choice of side item. Choose from fries, broccoli, celery sticks, pineapple coleslaw, chips, mashed potatoes or fruit cup. For children 10 years and younger, please. Romaine lettuce, tomatoes, red onions, cucumbers, Kalamata olives and pepperoncini topped with feta cheese and our grilled 8 oz. salmon. Served with Greek dressing. Seasoned 6 oz. sirloin served over a bed of salad mix, tomatoes, cucumbers and topped with bleu cheese crumbles, onion straws and your choice of dressing. Our fresh Angus burger with American cheese, mustard, pickle, mayo and tomato wrapped in a grilled tortilla. Includes your choice of one side item. Thinly sliced ham and turkey combined with smoked bacon, cheddar jack cheese, lettuce, and tomato wrapped in a grilled tortilla and served with ranch dressing. Includes your choice of one side item. Marinated grilled chicken, cheddar jack cheese, smoked bacon, mayo, lettuce and tomato wrapped in a grilled tortilla and served with ranch dressing. Includes your choice of one side item. Crispy fried chicken tossed in spicy buffalo sauce with parmesan cheese, lettuce and tomato wrapped in a grilled tortilla and served with bleu cheese dressing. Includes your choice of creamy coleslaw or potato salad. Named after one of our first customers. You'll order this one again. Premium roast beef and Swiss cheese on grilled rye with mayo, lettuce, tomato, pickle and onion. Ham, salami, and Swiss cheese served on authentic Cuban bread (from a 100-year-old Florida bakery) with lettuce, tomato, pickle, mustard and mayo. Thinly sliced corned beef topped with Swiss cheese, sauerkraut, 1000 island dressing and mustard on grilled rye. Sliced turkey smothered in melted Swiss cheese, coleslaw and 1000 Island dressing on grilled rye. Premium Roast beef, sliced onions and provolone cheese, served hot and pressed on garlic Cuban bread. Loaded with flavor! Chicken grilled with green peppers and onions, topped with white American Cheese on a famous Amarosa hoagie roll. A trio of flavor with juicy grilled shrimp, Angus skirt steak and seasoned chicken grilled with peppers and onions. We hope you were able to pace yourself! Mild, Medium, Hot, Extra Hot, Nuclear, Honey BBQ, Garlic, Teriyaki, Sweet Jalapeno, Kickin' Bayou BBQ, Garlic Parmesan. Includes Celery and Bleu Cheese Dressing. Small serves 6-8. Salads served chilled. Large serves 8-12. Your choice of sandwich or wrap with choice of chips, pineapple coleslaw, or potato salad, and something sweet. Minimum order of 5 please.